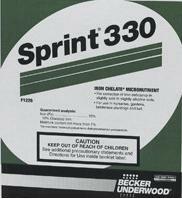 I do have another product that is less costly than the Sprint. This one is appropriate to foliar feeding of the plants but since it has some other nutrients in it, I’m not recommending it for use in the Aquaponic System water. 10% DPTA chelated Iron. Chelated Iron (+ other nutrients) For foliar feeding only. Liquid 16 oz $5.95 for foliar spray only. Why use DTPA instead of EDHA? Understanding iron Chelates If paypal over charges you for shipping, I will refund the difference! The paypal shipping calculator is NOT very flexible and the sales here are not enough to justify paying some one to build/integrate a cart for the web site. If the shipping price issue makes you NOT want to go through with the sale, please contact me with your shipping address and what you want to order. I will make up a custom paypal invoice with the exact shipping calculated manually. This Sprint 330 10% DPTA chelated Iron is what I have been using in my aquaponics systems for the past several years. I have regularly dealt with source water high in calcium carbonate that keeps my system pH elevated and causes my plants to suffer Iron deficiency if I am not supplementing with a form of Iron that remains plant usable at a pH of around 7.6. I do not advocate simply adding Iron all the time. Pay attention to your plants and learn the difference between deficiencies. Iron deficiency shows as new leaves yellowing but with the veins staying green at least at first. If in doubt there are iron test kits available. An Iron level between 2-3 ppm is all you really need and some source waters may be high enough in iron to provide plenty when combined with a good fish feed and a system pH between 6.5 and 7.0.
do you think it should be used or not in Commercial aquaponic ? This particular product, No I wouldn’t use it in aquaponic water and I don’t think it is the appropriate product for commercial production. Chelated Iron in General, Yes it will need to be used when it is needed in commercial production. Can you recommend a specific iron to use with a ph of 7.8? I used an EDDHA by Miller and it turned my 800 gallon system red!! Iron supplements are likely to cause some tinting of the water in a system. The DPTA Iron I use tends to turn the water a bit orange or amber. Slighting tinting the water is not problem at all but you don’t want to be too extreme in your dosing. If you are running a commercial system you may want to get an iron test kit so you can monitor your Iron levels so you are not over dosing. Iron levels of 2-3 ppm are generally sufficient. Please help me understand which iron product can be used in my aquaponics tank/garden. Above it appears that you state that you use this 330 in your aquaponics system, but in the comments above it is stated not to use it in an aquaponics tank? Please explain. there are two different products listed on the page. The sprint 330 I do use in my aquaponic systems. The other product has other nutrients (like copper and zinc) in it that I am not comfortable using in aquaponics unless I am able to accurately measure their levels to make sure they don’t become toxic to the fish.